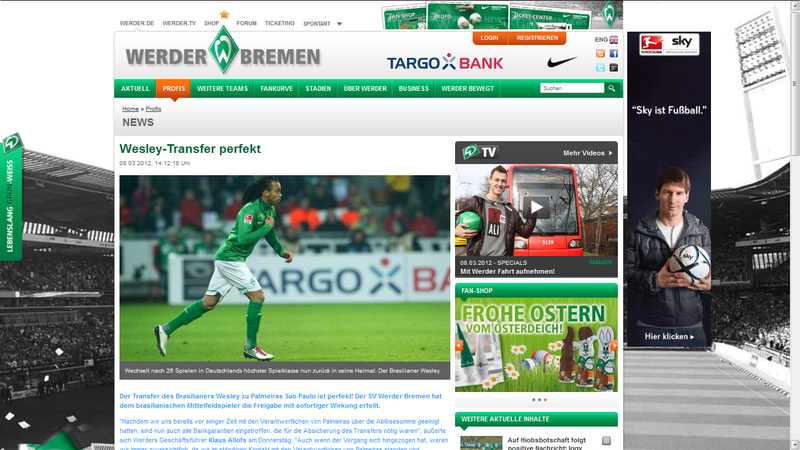 This morning, Werder Bremen issued a press release on their website (screendump to your right), stating that the transfer of Wesley to Palmeiras was a done deal as the German club finally had received the needed bank guarantees for payment of the midfielder. With this, Werder Bremen’s president Klaus Allofs with immediate effect released Wesley to sign for Palmeiras. It soon became clear that the news had not been “sanctioned” by Palmeiras’ directors; not that it needed be under normal circumstances, but as Palmeiras are in the middle of a tragically badly conducted campaign to pool money from supporters through crowdfunding “in order to sign Wesley”… By releasing Wesley, the Germans signal that they have either received the first instalment or received waterproof insurances (bank guarantees) that the full amount will be deposited in due time. In any case, they consider the deal closed. “I don’t know what they are talking about” said Palmeiras president Tirone to the press this afternoon, trying to keep up the sense of urgency in palmeirenses donating their cash to help contracting Wesley. Could he be more pathetic? Yesterday, we saw the kickoff of the Copa do Brasil. The competition, popularly referred to as “the shortest route to the Libertadores Cup” will not be as short a route as of next year, when participating teams will expand from the current 64 to 86. But we’re still in 2012 and Brazil’s most democratic tournament takes place in home and away games, where the first leg away team has the advantage of eliminating the second leg in case of a win by two goals or more. Palmeiras’ debut takes place next Wednesday against Coruripe from the state of Alagoas. For the opening game the Verdão cannot count on Valdivia, Luan and João Vítor – all three suspended. Today the Brazilian Football Federation (CBF) made public the tables of this year’s edition of the Brazilian Championship. The Brasileirão starts on 20 May (perhaps already on the 19th) and ends on 2 December. As happened last year, the final rounds are market by great derbies. The full tables can be downloaded here. As you can see, Palmeiras’ first game is at home against Portuguesa, one of the four newcomers (the other three are Náutico, Ponte Preta e Sport; relegated were Avaí, América/MG, Atlético/PR and Ceará). A good way to start, if you ask me. 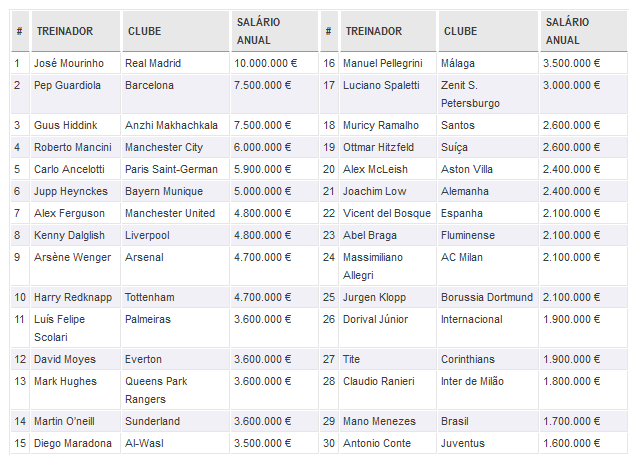 The Portuguese site Futebol Finance today released figures over the top 30 best paid football coaches in the world. Mourinho heads the list followed by Guardiola, Hiddink and Mancini. Our own Scolari is to be found at 11th place and is the best paid Brazilian of the lot. Check out the top 30, including other high-ranking Brazilian coaches, by clicking the thumbnail to you right.